As sweet as cinnamon: Easter bunny left a Fishy! 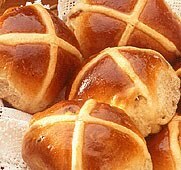 and some yummy Hot Cross Buns. Have a wonderful day Easter Sunday. Happy Easter Dawn!!! Your dolphins are SO adorable - sounds like a lovely morning, as long as a nap is on the schedule, lol! We have Daylight Savings too, and it ALWAYS messes me up, whether I gain an hour or lose one. So glad daylight saving is over! Now the light will be right again (the mornings have been soooooo dark!) Glad too that your girls have had such a great morning! We did our traditional easter hunt on Thursday because we are camping this weekend. Such a lovely time! Dawn, your "Dee Dee Dolphins" turned out so cute. I wish I had one! LOL And it is such a delight to hear the laughter of children...that's got to be one of the sweetest things on earth. Enjoy that nap! Blessed Easter my dear friend!!! 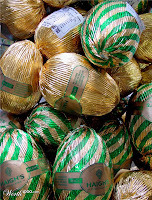 The dolphins look great and I hope the girls dont get a tummy ache from the chocie eggs. I hope you did get that rest and feel better tomorrow. Hope to see you tuesday. What a lovely way to spend Easter happy days to you all. Just gorgeous to hear the squeal of happy kids on Easter Morning even at 6am. You can tell I am a granny now and don't have to hear it EVERY morning.LOL. Love the Easter Dolphins too!! Happy to hear you had a lovely Easter... well done on making Dee Dee.. they sure are cute.. The Dee Dee Dolphin twins are so cute . What a pair - they have such a twinkle in their eyes. What a great treat for the girls. That AND the Easter egg hunt must have made Easter very special for them. I'm not surprised you were sorely in need of a cuppa and a Hot cross bun. Oh Dawn, your dolphins turned out wonderfully!!! Your girls must be so happy with them! Sounds like they had the best fun during the Easter Egg hunt! I'll have to borrow someone elses kids next year and do a hunt!